He received his medical degree from the University of Mississippi in Jackson where he also completed a one-year internship in internal medicine. He completed his residency at Texas Tech University training in ocular surgery and diseases of the eye. Dr. Norton trained at Stanford University Department of Ophthalmology and at the University of Wisconsin Department of Ophthalmology. 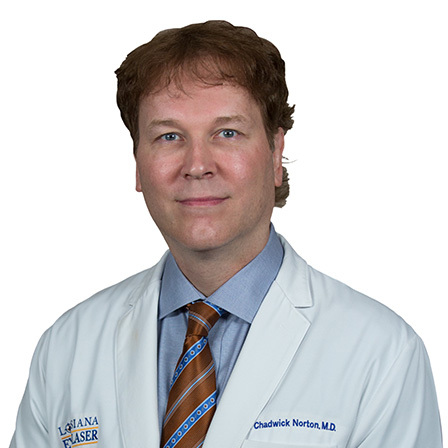 Dr. Chad Norton is a board certified ophthalmologist who has spent years extending his training in the area of facial/oculoplastic surgery. He is a national committee member of the American Academy of Facial Plastic and Reconstructive Surgery; and is also a member of the American Academy of Cosmetic Surgery. He is a certified Botox®, Restylane®, Perlane®, Juvederm™ and Radiesse™ provider. Dr. Norton also specializes in treatment of eye diseases, such as glaucoma, macular degeneration, and diabetic retinopathy. He also performs surgery of the eye including no-stitch and bladeless cataract surgery, premium lens implant surgery, and blepharoplasty (eyelid) surgery.